FREDERICKSBURG, Virginia (CNN) -- After nearly three years of excavation, archaeologists have confirmed the discovery of the site of George Washington's boyhood home near the banks of the Rappahannock River in northeast Virginia. 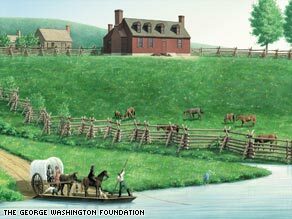 An artist's rendition of what the Ferry Farm may have looked like during the 18th century. Digging into the red clay of Ferry Farm, a former plantation in Fredericksburg, has unearthed the footprint of the home of the nation's first president when he was a young boy. The site of the plantation -- which would have included the main house and other structures including a slave quarters -- is nestled along 800 acres of rolling farmland, cherry trees and the banks of the Rappahannock River. Archaeologists hope the site will shed light on the gray areas in the life of America's most famous founding father. It was at the Fredericksburg farm where Washington, according to legend, could not lie to his father about chopping down a cherry tree. But Paul Nasca, the foundation's staff archaeologist, said it was unlikely that any of the farm's cherry trees fell victim to the young Washington's ax. "There's no doubt the Washingtons had cherry trees out here," Nasca said. "But we do believe the great tale of Washington chopping down the cherry tree is myth. We haven't found the cherry tree, and I don't think we'll ever find the cherry tree." However, Virginia Gov. Tim Kaine, on hand for the official announcement of the find Wednesday, said the legend still speaks to Washington's honesty and integrity. "Even if they are myths, they portray what people thought of him," Kaine said. The historic site is open for visitors. In five to seven years, the foundation hopes to build a replica of the house near where the original stood. "We were very concerned all of this occupation may have obliterated the Washington home," Nasca said, "but, in fact, we were most pleased to find -- even though they are fragmentary -- [that] there are significant archaeological facts associated with the architectural footprint of the Washington family home." The plantation house was modest by the standards of the time. It was 53 feet by 47 feet, stood a story and a half high, and had two chimneys. The house also had a limestone cellar. The carefully laid limestone blocks of the cellar can now be seen peeking out from the ground excavated by a team of experts, interns, and volunteers. Nasca says the limestone blocks were probably quarried in Virginia and laid in place by slaves. He says the Washingtons owned slaves, and there is evidence of slave quarters near the main house. The foundation is continuing to excavate the site for artifacts. After sifting through the dirt, one young archaeologist found a nail, some window glass and ceramic shards from what used to be the home's front yard. As the team dug, they also uncovered a Civil War trench used by Union soldiers in the Battle of Fredericksburg. The Washington farmhouse would have been long gone by the fall of 1862, when the soldiers dug in for the winter on the Union side of the river. It appears the the soldiers' trench ran into the foundation of the old house and took a 90-degree jog around what would have been the main chimney of the Washington home.